Thousands of retired Algerian soldiers clashed with security forces when prevented from entering capital Algiers to stage a demonstration to demand benefits such as social housing and medical treatment. The former soldiers, who fought in the bloody civil war in the early 90s, have long demanded that authorities revaluate their pensions and provide adequate medical aid to troops disabled on duty. Authorities have so far rejected the demands. 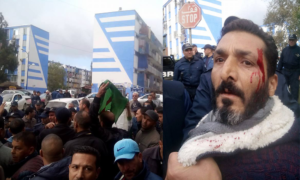 On Monday and Tuesday, the retired soldiers clashed with security forces after police attempted to disperse their sit-in outside Algiers by firing tear gas canisters. According to protest organiser Marawan Bassaf, 20,000 former soldiers from across the country have gathered for the demonstration. Algeria’s civil war, known as the “black decade,” pitted a myriad of Islamist forces against the central government, leaving thousands dead. Posted by Khalid Al Mouahidi on September 26, 2018. Filed under News. You can follow any responses to this entry through the RSS 2.0. Both comments and pings are currently closed.